ARE SOUTHERN BAPTISTS DESPERATE TO ELECT MITT ROMNEY? Although Apprising Ministries itself takes a non-denominational approach, at this time its home church is still with the SBC. I also have been an SBC pastor since 1994. 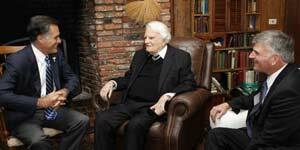 Evangelist Billy Graham historically has been a highly respected figure in the Black Community. Long before it was popular, he insisted on his meetings being racially inclusive, befriended Black preachers (including Dr. King) and singers and publically disagreed with Dr. W.A. Criswell’s segregation views, prior to his “open door” conversion. Billy Graham was highly regarded in the home I grew up in and viewed as a man whose heart was in the right place regarding issues of race. However, Billy Graham’s recent departure from his lifelong practice of not engaging in partisan politics, and his removing the Mormon Religion from his website as a cult has generated a lot of discussion among Black pastors. The impression Graham’s decision leaves is that for the sake of electing Mitt Romney as President, he is willing to declassify Mormonism as a cult and engage in partisan politics for the first time in 94 years of living. The question many are asking is, “why”? And, why now? If nominal Southern Baptists as Bill Clinton and Al Gore occupied the White House at the curret moment, the question is would Billy Graham have made the same decision? Even Ed Stetzer and Richard Land have taken a softer view on labeling Mormonism as a cult. Why? Stetzer and Land want to label Mormonism a fourth great world religion. Why? Unbelievable! Are Southern Baptists that desperate to elect Mitt Romney? The Southern Baptist Convention unanimously approved a resolution condemning President Obama’s position on gay marriage and his view of equating gay rights with civil rights—but refused to even bring to the floor for a vote a resolution condemning racism in Mormon documents. The question is why would Southern Baptists approve of one, while rejecting the other?